BPM Festival 2017 dates are set for what promises to be the biggest and best BPM Festival yet. From January 6th through the 15th, 2017, the BPM will celebrate its tenth anniversary in Playa del Carmen. More than 365 artists are expected to participate in the ten-day festival, whose crowd is expected to top 80,000 BPMers. Check out the link for the 2017 BPM line-up and ticket information. As part of the ten-year anniversary celebration, festival organizers sold a first round of super early bird tickets online. The result surpassed all expectations with the specially-priced festival passes selling out in a mere 27 minutes. 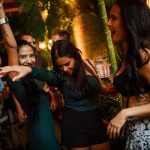 PlayaDelCarmen.com sat down with Alessandra Axelsson, Director of Operations & Finances for the BPM Festival, and Maria Azana, whose PR company makes sure that the BPM community continues to grow in Mexico and worldwide. They share their thoughts on the growth of the BPM, the festival’s impact on the community, the challenges or organizing such a major event, and most importantly, what we can expect this year and going forward. 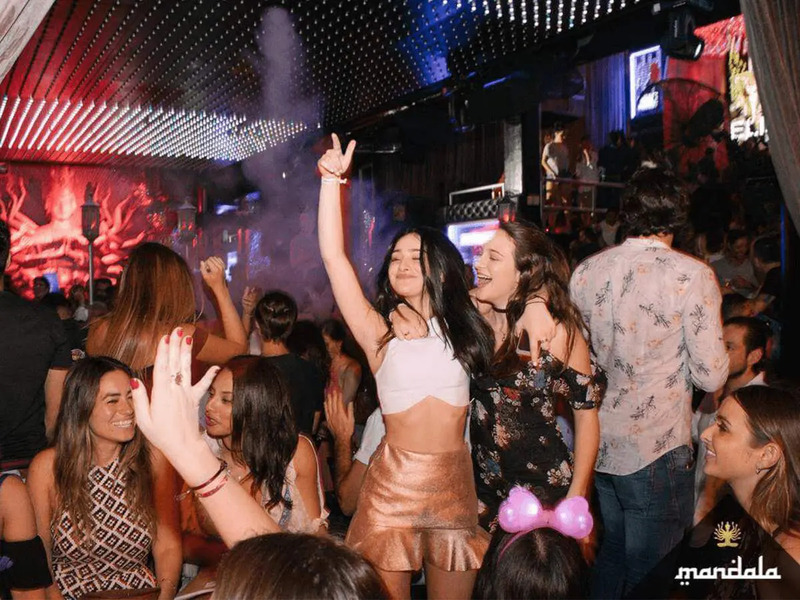 Ten years after its humble beginnings in a Playa del Carmen much different than the one we see today, BPM has become one of the most well-known musical festivals in the world. Some have even called it Ibiza 2.0. But how many of us out there know what BPM stands for? 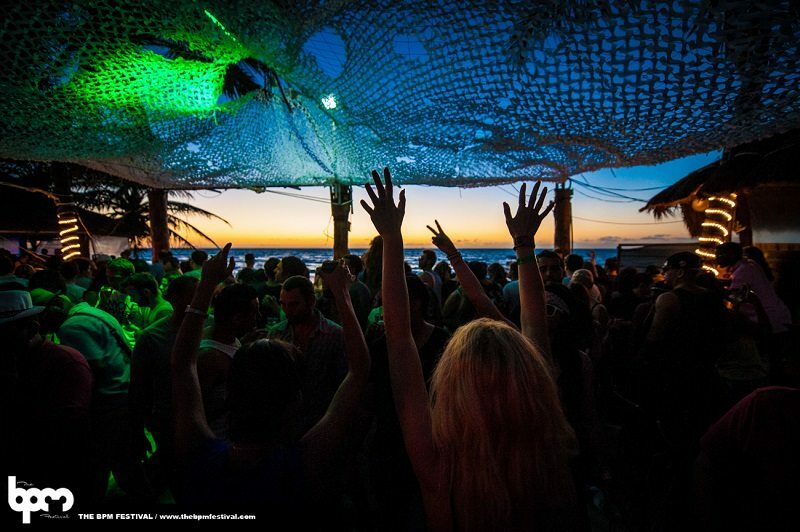 The idea for the BPM Festival developed out of a group of friends looking to organize something for themselves. Veterans of the hospitality industry, and all too familiar with the low-season blues directly after the New Year’s celebration, they sought out a place to have a sort of friendly retreat. Relax and mingle during the day, party at night. 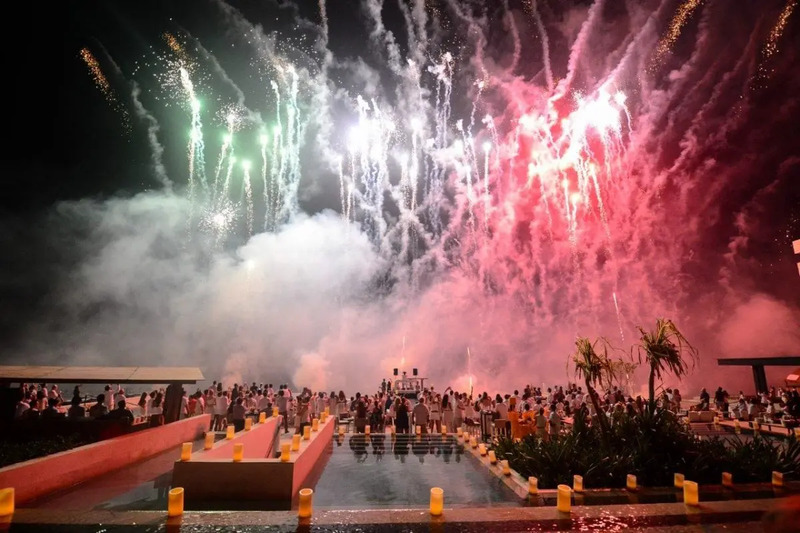 After considering several other locations, including a Caribbean island or somewhere in South America, Playa del Carmen won the coin toss and was selected as the destination of choice for the first BPM. Perhaps it helped that two of the founders of the festival found themselves together drinking beers and the occasional tequila on the white sands beaches of this charming town on the Caribbean Sea. And so was born what would soon become a legend: the Bartenders, Promoters, and Managers/Musicians (BPM) Festival. Like the BPM Festival itself, which grew from an estimated 5,000 festival-goers at its first edition in 2008 to almost 70,000 last year, Playa del Carmen continues to grow and develop as a city. 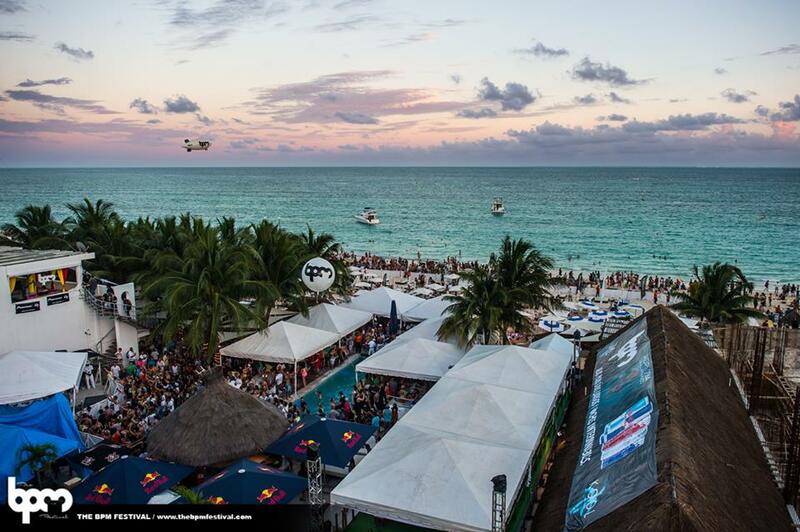 In fact, Playa’s population has grown from under 160,000 in 2005 to more than 215,000 today. When asked about this parallel growth of the festival and the town that hosts it, Alessandra Axelsson, Director of Operations & Finances for the BPM Festival, expressed her thoughts. 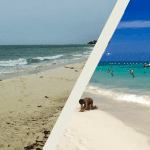 Historically, January is a slow month for tourism in the Riviera Maya. Fewer people travel, resulting in lower occupancy rates, slower sales, and even a spike in unemployment lasting anywhere from after the end of year celebrations and up until around Spring Break. “The city has contributed to our growth and we have contributed to the city’s growth,” she added. Whether you’re a fan of electronic music and what’s arguably it’s most important festival expression this side of the Americas, there’s no denying the impact that the BPM Festival has had on the region. 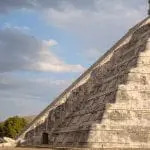 , transportation from Cancun airport to Playa del Carmen, festival passes, food, drink and the occasional souvenir, the impact is significant, especially during low season. Combining all the cost factors together, festival organizers estimated that a BPMer spends anywhere from 500 to 700 USD per day. 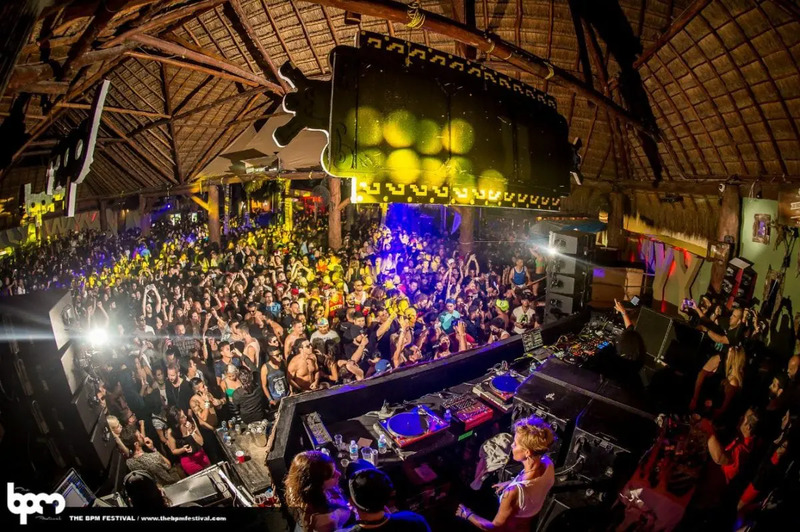 But beyond the numbers and the dollar signs, there’s another aspect of the BPM Festival’s impact in Playa del Carmen, less publicized but no less important. “We do a bunch of other things all year long. We work with all kinds of organizations, from animal organizations to DIF (the city’s social program for families), to the local soccer team, kids’ organizations, you name it,” explains Alessandra. However, being conscious of your role in the community is one thing, and the possible negative impact left by festival-goers another. 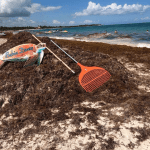 Trash and cigarette butts, the later which are non-biodegradable and extremely toxic to marine life, left on the beach are two of the biggest issues related to the influx of such a large and diverse crowd. “Are our fans conscious of this? If they’re not being as conscious as they could be, then what can we do to make sure that we pick up after them?” asks Maria Azana, the brains behind theBPM’s Green Team. 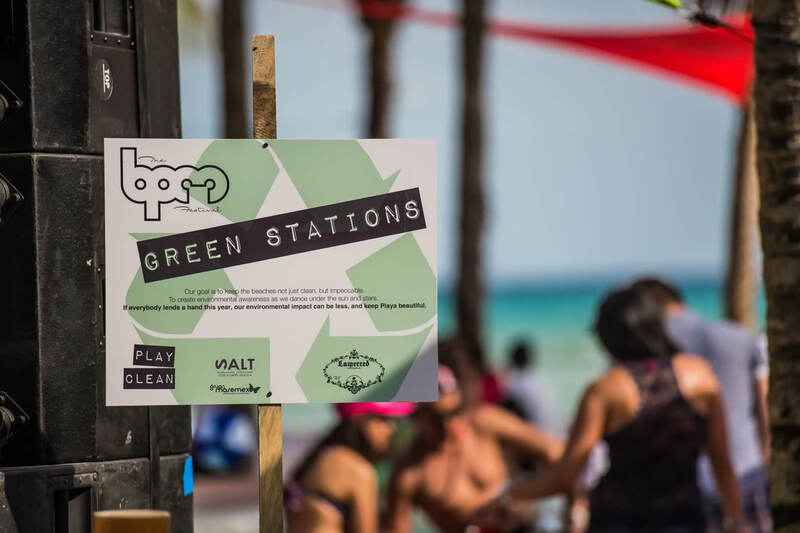 The initiative seeks to counteract the possible negative environmental impacts of the festival. The Green Team cleans the streets and beaches, participates in recycling programs, and involves the BPMers along the way. “Outside of an energy in your heart and soul, we don’t want the environment to feel that we were here,” explained Alessandra. 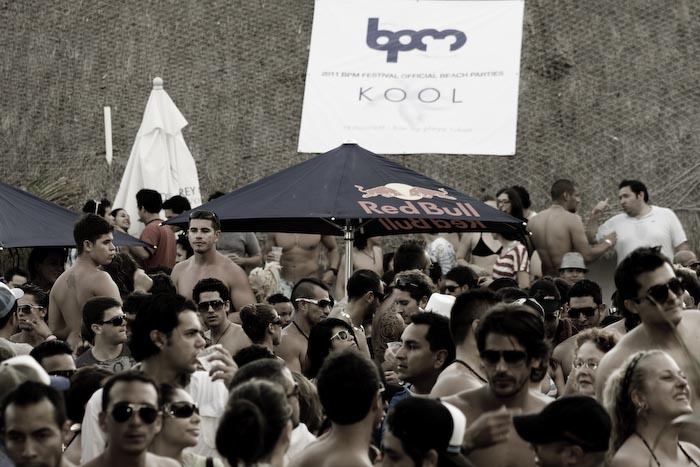 The BPM Festival has come a long way since its first edition in 2008. It has matured and evolved, going through each stage of the process with the expected growing pains and challenges. Preparations for the next edition of the festival generally start a mere four weeks after the previous incarnation. A team of 18 people, which swells to around 1,000 once the festival finally rolls around, keep things afloat, paying attention to thousands of small details of which festival-goers are largely oblivious. “It’s intense. Strange challenges just pop up out of nowhere. Every year we’re presented with a new set of difficulties that we overcome, the following year and we make improvements on them, and then the next year we’re presented with a fresh set of completely different challenges. It keeps us on our toes,” relates Alessandra. Part of the challenge involves finding the right venues for such an overwhelming and intense ten-day entreprise. As the number of BPMers grow, so too does the need to offer spaces that can fulfill crowd requirements. 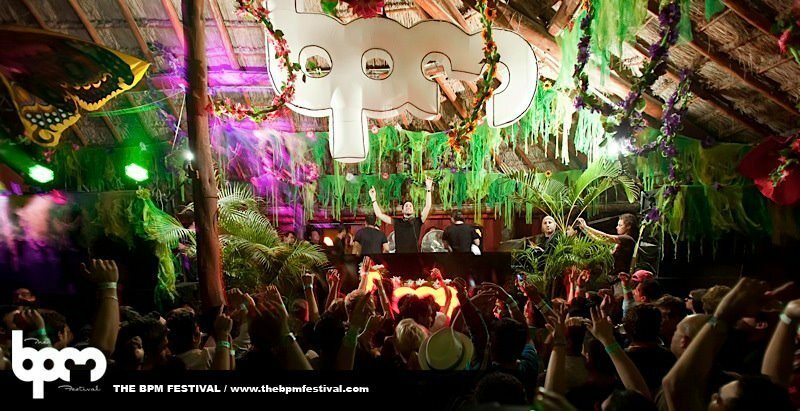 Last year, the BPM introduced its very own jungle venue, built exclusively for the festival. 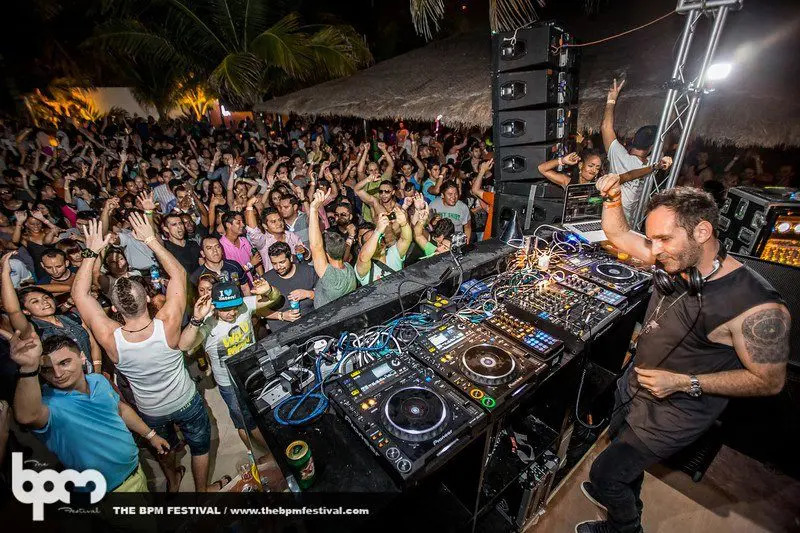 After nine years of undeniable success and constant growth, with each version of the BPM Festival bigger and better than the last, festival organizers are under a lot of pressure to outdo themselves once again. Alessandra predicts that with this being the tenth anniversary, the staggering number of BPMers is going to increase significantly over the already mind-blowing 70,000 festival-goers from last year. That said, however, not all of those people are concentrated in one place at one time but spread out over several venues during a ten-day period. While it’s too early for specifics, Alessandra promises to announce some pleasant surprises at the tenth-anniversary press conference. Ouch. The bar has been set. Both veteran BPMers and BPM virgins could benefit from a few tips on how to make the best of this year’s festival. 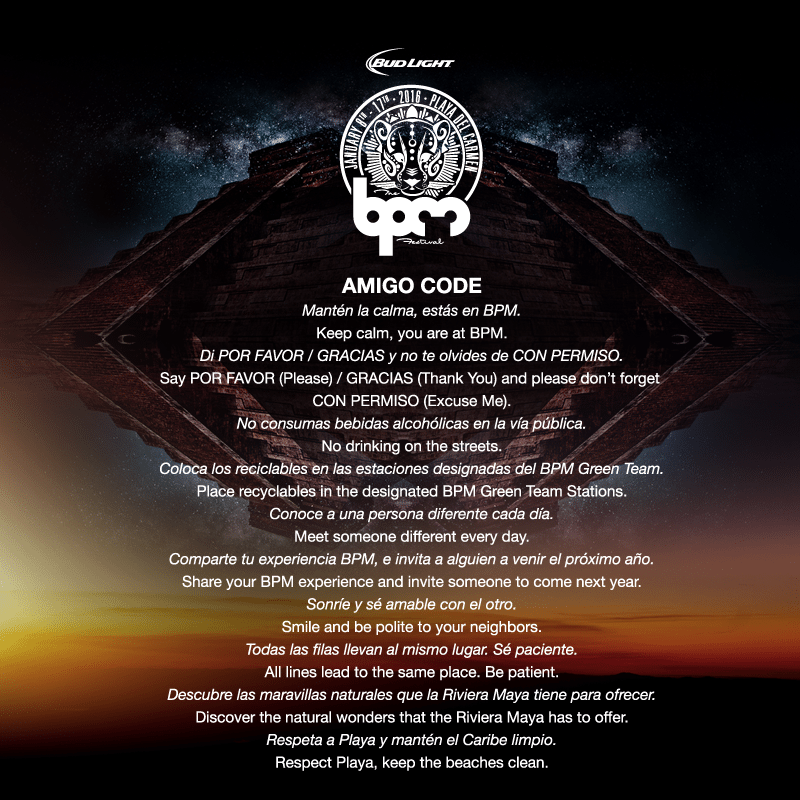 One important piece of BPM advice comes in the form of the festival’s Amigo Code. Like a code of conduct, it helps guide festival-goers on how to stay safe and have a good time. The Amigo Code invites BPMers to place recyclables in their designated Green Team stations, to show patience and respect, and to not drink on the streets, among others recommendations. Festival organizers also suggest that the BPMers get out and discover the local culture and cuisine. 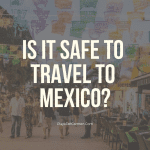 First-timers, for instance, should wander off 5th Avenue and try some real tacos and the local cuisine at Playa del Carmen restaurants. 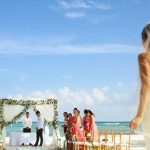 Likewise, festival-goers should plan time to find things to do in Playa del Carmen such as visiting the Mayan ruins andswimming in cenotes as well as discovering the fascinating underwater world of the Caribbean Sea on a snorkeling or diving excursion. As children become teenagers and teenagers turn into adults, the time eventually comes when that child is now a grown-up, ready to conquer the world far from the confines of his or her own home. 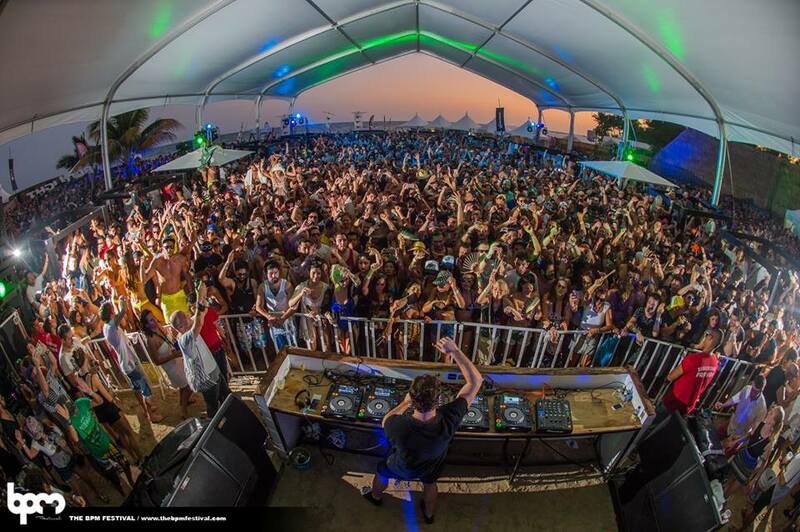 The BPM Festival is no different. Last year, the BPM Festival organized a series of pre-festival music events at some of the world’s most important metropolis. 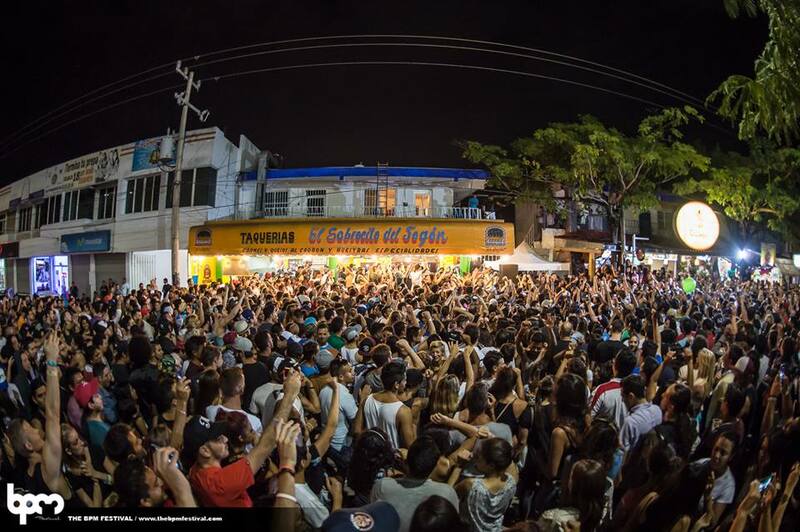 Barcelona, London, L.A., Mexico City and Toronto formed part of the list of distinguished international cities hosting the BPM Festival On The Road. This year, that tradition will continue starting June 15th in Barcelona. In total, ten events will be held as part of the celebratory On the Road to Ten Years of BPM pre-festival shows. But those are mere baby steps. 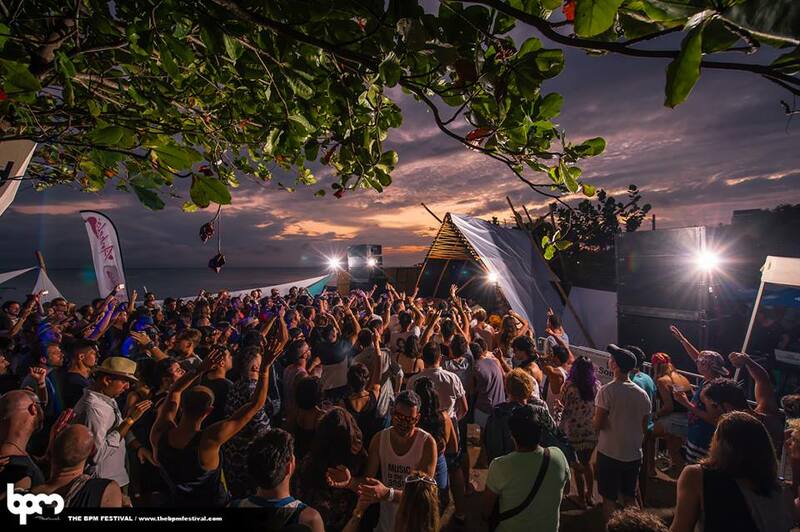 The BPM Festival is finally ready to announce what many have been speculating about for years. “Over the last two years we’ve been getting people prepared lightly talking about expansion plans,” explains Alessandra. “I can definitely confirm that we will be making the announcements this year at our ten-year anniversary press conference. Our home and our heart will always stay in Playa, but we’re going on the road,” she added. As mentioned at the beginning of this article, the super early bird tickets sold out in less than thirty minutes. The next early bird round of festival passes will go on sale on July 1st. In honor of the festival’s tenth anniversary, a limited number of three-day, opening, closing and seven-day passes will be available for purchase. After that, regular prices will be made public by August, and the cost of individual tickets will be announced together with the full event schedule in the fall. Keep up-to-date with all the exciting details of the upcoming tenth anniversary celebration of the BPM Festival 2017 website. 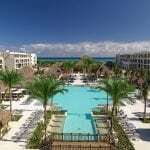 You can also check out our links for top BPM hotel accommodations, airport transfers, and Playa del Carmen excursions. BPM Festival 2017 Line-Up, Tickets, Where to Stay & More! Coming to Playa now for the 4th year, can’t wait to see eat, drink, dance and make plenty of new friends! Sounds great, Chris! Let us know if you have any questions or need any help planning your BPM journey! Chris, this will be my first year! But I would really love to go, shoot me a msg! Any news on regular price 10-day pass ticket release date? Looks like they’re keeping us in suspense for a little while longer! 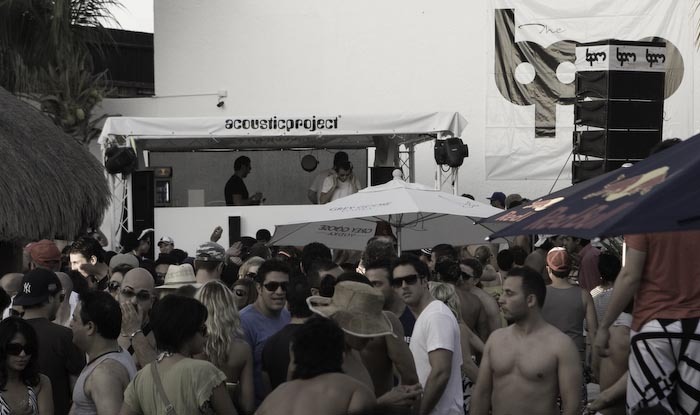 The BPM Festival works on the concept of passes. They are trying to accommodate the diverse needs of festival-goers, but as far as I know they never offer tickets for individual shows. That said, I think we can be expecting the full details of all tickets and pricing shortly. In the meantime, you can also check out BPM’s already sold-out Early Bird Tickets. Hi there, we are first timers all the way from New Zealand. We have planned our whole trip around hopefully getting the 3 day opening festival passes. But by the looks of things it is going to be a sell out and pretty fast at that!. Our concern is with the time difference we will miss the ticket release while sleeping and miss out on tickets?!? I have signed up to all the mailing lists but thinking that that may not be enough. I understand your concern and wish there was something we can do, but BPM is keeping a tight lip about their upcoming announcements and ticket sales. I doubt they will just announce the date of sale on the same day, so you’ll likely have time to plan ahead and set your alarm. Early bird tickets have gone extremely fast, so your concern is legit. I would also recommend setting up a Google Alert; you can determine the frequency so that you could receive all related news and updates as soon as they are published. Good luck and please don’t hesitate to reach out if you have any more questions. Hopefully you’re also planning in so time to see the region. Sounds great! I’ll have a travel guru reach out to you via email shortly. Don’t hesitate to reach out if you have any more questions! Yes! Sort of. Kind of. Soon! Only the early bird tickets have been sold, and regular-priced BPM 2017 tickets have yet to go on sale. I imagine they are going to go fast once they do go on sale, so I would recommend you sign up to the BPM Festival newsletter on their site and maybe set up notifications for their social media. I would imagine they could go on sale any day now, so staying alert will help you make sure you don’t miss out on the 10th anniversary celebration! No problem at all. The opening refers to the first three days, and the closing the final three. Opening weekend tickets Re sold out and I need one. Do anyone know if they release any for sale @ box office? Or does anyone have one for sale? Hi Gabe, BPM tickets for sold-out shows are going to be hard to get. Perhaps not impossible, but I’m not even sure where you would look for tickets not sold directly through BPM. Good luck! 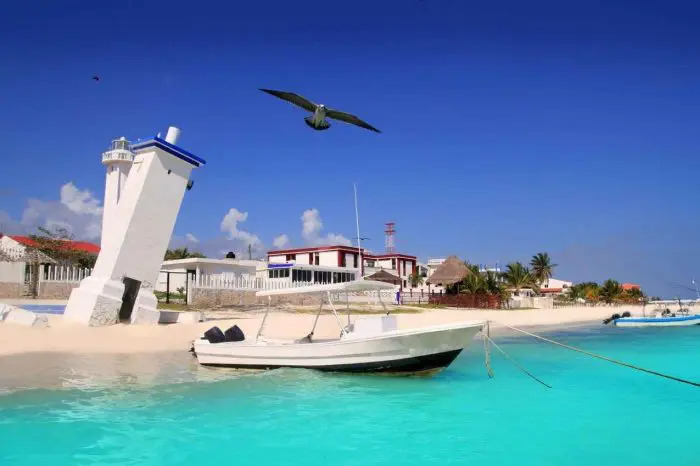 Do you think it would be cheaper to arrange transporation for 5 people from CUN airport to our condo on mamitas beach ahead of time or just find a taxi the day of? I’ve been quoted 60USD one way. Also is it cheaper to look for tours to the cenotes ahead as well or just see what the deals are when we get there? I would avoid trying to arrange a taxi upon arrival. Not only do they tend to be more expensive, but with so many people coming for BPM it could provide to be difficult. 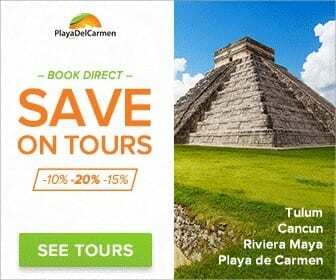 Our cost for round-trip airport transfers from Cancun to Playa del Carmen is $145 USD for up to 8 people. Also, don’t risk going with Über Cancun either, as they are having a lot of issues with the taxi unions. 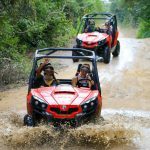 As for the cenote tours, you’re going to wind up paying the same prices no matter what. The problem with being spontaneous when looking for your tours is the fact that quality can suffer. Also, there are a lot of different options depending on what you are looking for as well. I will have a travel guru send you an email. They will be able to answer any questions you may have. 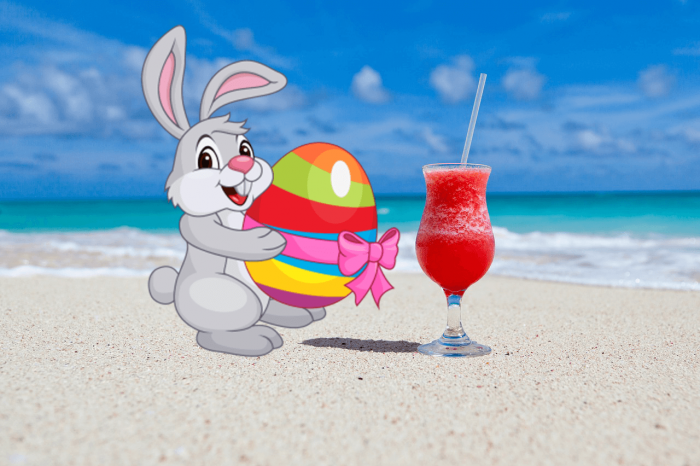 See you soon in sunny Playa del Carmen! Hi, I’m a PDC first timer coming in for BPM, I’m booking a place near/on 5th avenue Kinbe hotel, and wanted to check if the festival has events at this end of 5th avenue, I don’t want to be right in the centre of the thick of it but not too far either. Thanks! I’m not sure how much you’ll actually be able to hear or not from your hotel, but I can tell you this: you’ll be right by the action. 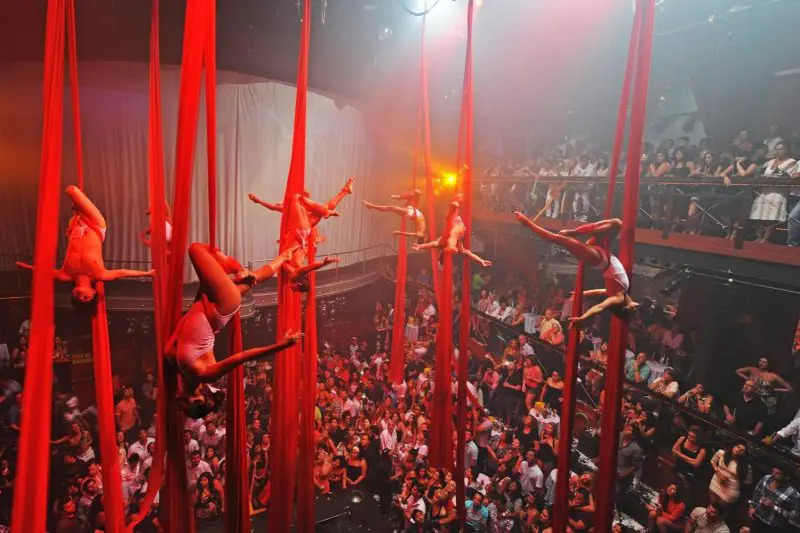 Kinbe is located just one block away from 12th Street, which is not only the main nightclub strip, but also where you’ll find Blue Parrot, which is one of the main venues for the BPM Festival. Anything that close to all the action is likely to have noise issues. Let me know if I can be of any further assistance! Watching from my eyes how the BPM Festival grew so rapidly in the past 3 years seems clear to me they are focused on their company vision. The first day after the festival ends take a look around and think back of each days events of the Good , Bad and the Ugly occurrences that took place there. How much of those findings contributed to a “successful” Festival? Final judgement comes from us (the fans) of their experience. When we are treated as a key element required for festival growth you keep that in focus. I appreciate that BPM continues to add to make a better experience than the last one. When I’m leaving on the last day with the look of “I cant wait for next year’s show” and every year it does get better and better, I want to believe they’re on a mission, focused on their future.